Yes, I've created one more caviar recipe to finish off the tin. ;) This has truly been a week of caviar! This recipe is an elegant way to serve caviar, and yet, is deceptively easy to make. If you use sustainable caviar (i.e., Mottra, California Caviar, Petrossian, & the like), you'll be doing the environment a big favor, as other types of sturgeon are becoming rarer & rarer, & will soon disappear if we don't leave them alone & practice responsible consumption. Directions: Bring a medium-sized pot of lightly salted water, seasoned with a drop of olive oil, to a rolling boil, about 8 minutes. Meanwhile, melt the butter on low heat in a large (12-13") sauté pan for about 30 seconds, stirring occasionally. Then add olive oil, bay leaf, shallot, garlic, & fennel, & sauté for 3 minutes. Then add mushrooms, & cook for an additional 3-4 minutes, or until mushrooms have become golden brown around the edges. Then add thyme & tarragon, and cook for another minute. Deglaze with Champagne & chicken broth until liquid's volume has been reduced by half. When pot of water has reached a rolling boil, add pasta & cook until al dente, according to package instructions. (Barilla's linguine takes 9-11 minutes to cook.) When ready, drain into a colander, pouring over a bowl to reserve the pasta water. Shock pasta with cold water, drain again, & then set aside. Meanwhile, in a medium sized bowl, add sour cream, creamer, reserved pasta water, lemon juice & zest, & pepper, & whisk together thoroughly. Set aside. Add pasta back into the sauté pan & season with salt, stirring frequently. When liquid has almost completely evaporated, remove from heat. Discard bay leaf. Add shredded Parmigiano-Reggiano cheese, parsley, & sour cream sauce, gently toss together. Let pasta cool for 3-5 minutes before adding caviar. (If the pasta is too hot, it will cook the caviar, & thus, ruin it. 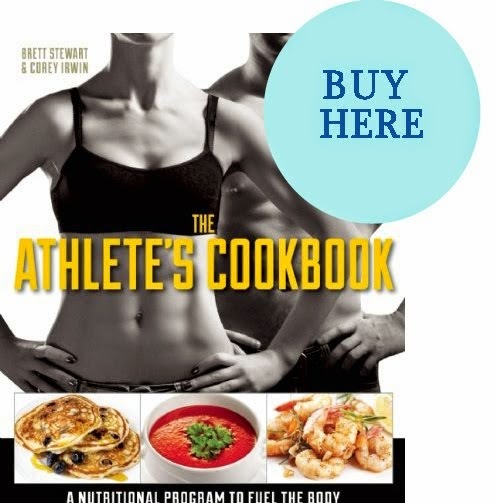 Cooking hardens the roe's outer membranes & makes it unpalatable.) 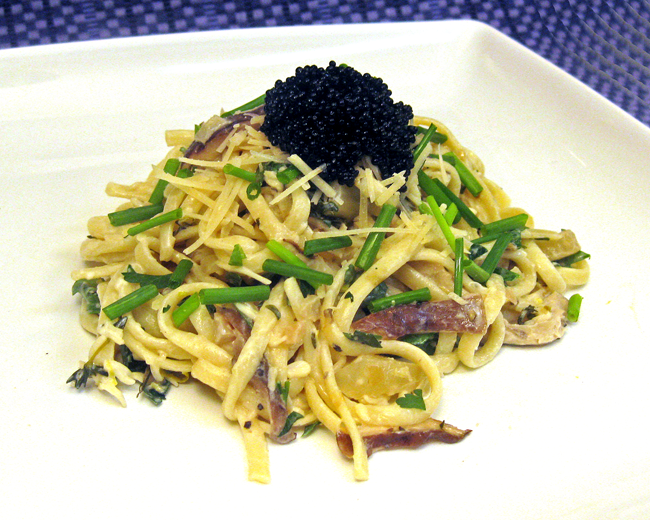 When pasta has sufficiently cooled, add caviar, gently toss, & then sprinkle with chives. (Be sure to be extremely gentle when tossing the caviar so you don't burst the roe!) Divide into equal portions & then transfer to plates. Serve immediately, along with a vegetable side dish, if so desired. Chef's Notes: This dish doesn't require very much salt, due to the addition of the caviar, sour cream, & Parmigiano-Reggiano. So go easy on the salt. You can always add more later, if you so desire. Also, when you select your caviar for this recipe, make sure not to use paddlefish caviar, which will be ruined when it comes into contact with the lemon juice in the sauce. Alternate Preparation Ideas: If you prefer, you can also drizzle sour cream on top of each portion, & then garnish with caviar & chives. If you do this, use 1/2 tablespoonful caviar & 1/2 tablespoonful chives per person. 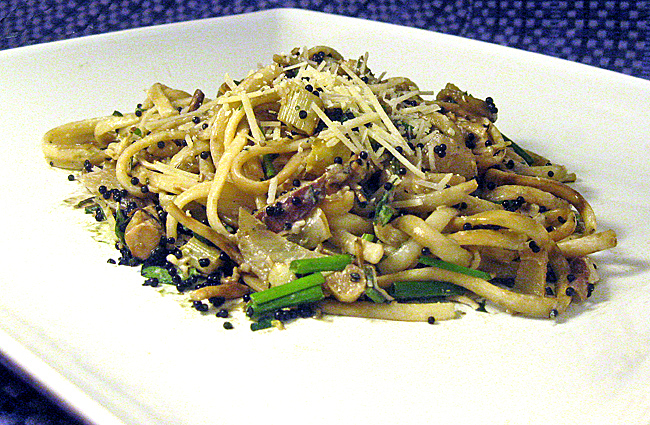 If you like, you also can top the pasta with a few pine/pignoli nuts. I have not tried your recipe but it looks delicious. I sell all types of Caviar that can be used with your recipes. Type "2011" in the checkout and receive 10% off your order.